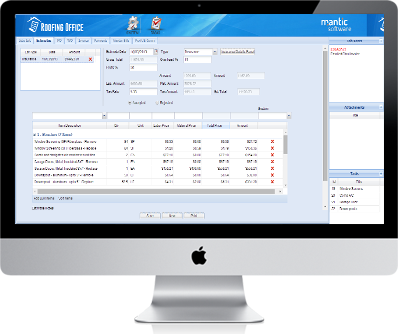 Stand out from the crowd and take a lead in your roofing business by incorporating Mantic Software Roofing product in your operations. We know that the success of your business relies heavily on the ability to generate quick and accurate estimates. Roofing increasing efficiency and speed by seamlessly integrating the processes of your business aligning them to achieve your operative objectives. The intuitive layout and design sets a new standard for a roofing software. We take our strength from satisfied clients worldwide, and unsurpassed support services. Your work management will be handled by the Roofing in a way it was never before at your company. Roofing Office is fast, accurate, and easy to use so you can significantly improve your takeoff, estimating, and proposal management processes. This construction estimating software allows you to quickly and accurately quantify, price, and bid projects. You can work with more efficiency, bid more jobs, win more work, and make more profit than you thought possible. Easily create vendor orders from your estimates. On winning a bid, create customer invoice out of your estimate with a single click. If you have sales team on commission, this software will make their commission calculations very easy. The best thing is this software can be modified and more features can be added on your request. Our team will help you to make to according to your need. So you don’t have to start making software from scratch. Stop making costly mistakes and find more profit in every job when you power up with Roofing Office. The most cost effective solution in the market.